Salvation And Survival: God Has Equipped Us! I remember when I was a first-year Journalism major at the University of Texas. Among the first things you're taught about writing is the five W's: Who, What, When, Where and Why. At this very elementary stage, our professor was equipping us to become good news reporters. But my first assignment was to cover a speech given by Madalyn Murray O'Hair, the activist and founder of American Atheists who led the movement to ban prayer in American schools. Even though I wasn't yet saved, there was something so distasteful about her, that I lost the desire for becoming a reporter and decided I only wanted to write about things that interested me. Although I didn't embrace that curriculum, I saw the value in being prepared to carry out the assignment; to be trained for that particular purpose, and to be ready and willing to do what was necessary to finish the task. In other words, how important it is know Whom you serve in this life; What your assignment is; When you are ready to act [and how]; Where you are to serve your God; and Why you've been called. It's been nearly four years since God made it clear to Mark and me that He was going to equip us to serve Him according to His will. 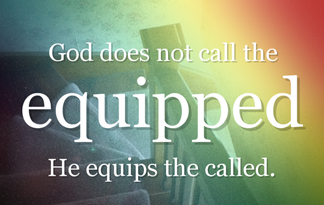 That word "equip" means He is going to give us the answers to the Who, What, When, Where and Why of our service. Hebrews 13:20-21 says that the God of peace will equip you with every good thing to carry out His will, accomplishing in us that which is pleasing in His sight -- all through Jesus Christ. The Amplified versions says God will strengthen you [making you complete and perfect as you ought to be]. When it comes to equipping us to be servants of the Most High God, it is obvious that Father God is the One who does the assignment of the task, and the strengthening for the accomplishing of that task. It is is not us. It is Christ through us. And the task is not based on who we are or what we can do, because it is certainly not determined by our pedigrees, our influence, or our IQ. It is based on Who He is and What He can do. In addition, What is being equipped is His will-- His good and perfect and acceptable will; whatever He needs done to achieve His purpose of reconciliation with mankind. When He equips is a two-part proposition; when He decides we're ready, and when we surrender to His will. The Why is easy... to declare the praises of Him who called us out of darkness and into His wonderful light (1 Peter 2:9); to give us everything we need for living a godly life through Him who called us for His own glory (2 Peter 1:3). This covers the basic and fundamental theology of God equipping us. But perhaps an even more significant aspect of this truth is How does God equip us? I think the most obvious answer (and the most Biblical one) is through the gifts of the Holy Spirit. The Bible tells us that there are varieties of gifts, but only One [Holy Spirit] who grants them and empowers them individually as He chooses. I want to make it clear that it is my belief that since all the gifts are present in the Holy Spirit, and the Holy Spirit is present in all believers, then all believers have all the gifts available to them. And since we are to have a relationship with the Holy Spirit, I do not find it unreasonable to think that we can ask the Holy Spirit for gifts that we discern we need in a particular situation. It doesn't matter whether it is faith, or healing, or wisdom, or a word of knowledge, or a miracle, or prophecy, or tongues, or the interpretation of tongues -- they are all gifts available through the Holy Spirit who empowers them. They are given to us. We should use them. God also equips us to serve His Kingdom by using our experiences with Him in this world to enable us to share His grace and mercy with others. Nothing encourages another human being more than our testimony of how God helped us through a difficult time in our life, whether it be health-related, soul-shattering, or a spiritual attack. He equips us by giving us a testimony that changes lives. The bottom line is that everything we are able to accomplish for the Kingdom on earth [which is our mandate from our Savior] is not because of our own efforts, but because God has equipped us to carry out His purpose for our life. We are His workmanship -- spiritually transformed, renewed, and ready to be used. He has set our paths before us, and we are fully capable of walking in them, if we trust and walk in obedience. He is our storehouse, our source, and our constant supply. We need never fear of being up to any challenge, because He will supply our every need, when we need it. Thank you, Father, for calling me and equipping me. Thank you for encouraging me and strengthening me, and may I never forget that I need You to help me answer Your call. And may my service forever glorify Your magnificent Name! Philippians 1:6 I’m fully convinced that the One who began this glorious work in you will faithfully continue the process of maturing you and will put His finishing touches to it until the unveiling of our Lord Jesus Christ!